Can I use mulch or pine straw around my rose bushes? I have rose bushes that I want to protect during the winter. 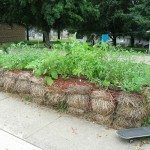 Should I use mulch or pine straw? Should I leave it in place during the spring and summer? Pine straw makes for a good all season mulch for the roses. If you have it, use it as it is one of the better ones to use.